The Hop has been called the Northern vine. It is found in a wild state throughout Europe, excepting the extreme North, and extends east to the Caucasus and through Central Asia. It is a handsome plant and not infrequently used as an arbor plant. The lower or basal leaves are very large, gradually decreasing in size toward the apex. Hops is also cultivated in Brazil and other South American countries, Australia, and India. The principal use of hops is in the manufacture of beer, to which it imparts the peculiarly bitter taste, and its repute as a tonic. For this purpose enormous quantities are consumed in Germany and England. The exhausted hops from the breweries form an excellent fertilizer for light soils. The leaves have been used as fodder for cows. Leaves, stems, and roots possess astringent properties and have been used in tanning. In Sweden the fiber of the stem is used in manufacturing a very durable white cloth, not unlike the cloth made from hemp and flax. 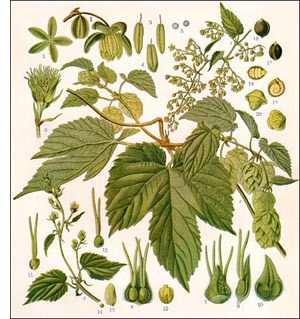 Hops is used medicinally. It at first causes a very slight excitation of brain and heart, followed by a rather pronounced disposition to sleep. Pillows stuffed with hops form a very popular domestic remedy for wakefulness. Hop bags dipped in hot water form a very soothing external application in painful inflammatory conditions, especially of the abdominal organs. It has undoubted value as a bitter tonic in dyspepsia and in undue cerebral excitation.